This entry was posted in Comments about Cycling on February 13, 2017 by Steve Tilford. Yesterday I received a text from Brian (Jensen). Showed him on a podium. Brian had told him he was going to do a race in Colorado on Sunday, but I had sort of forgotten. It was from a gravel race in Lyons, called Old Man Winter, I think. It was really an adventure weekend with a couple bike course, 50 and 100km, then a run. Anyway, Brian looked like he had a good race, finishing 3rd. He said that he lost the leader, 1st and 2nd on an icy section and never saw them again. Still, I rode with Brian just a little over a month ago and he wasn’t in typical Brian shape, so he must have either been training pretty hard the last few weeks or suffered like a dog. He has both those arrows in his quiver. I had it was the first, not the later, for his sake. Seemed like a pretty good field. 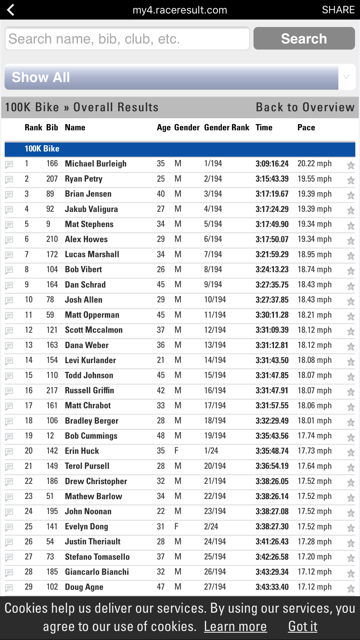 I only know the guys that finished behind Brian. Matt Stephens, the guy whole beat Lance in Texas a couple weeks ago in a 100 mile gravel race was 5th and Alex Howes, a Pro on the Cannondale-Drapac team was 6th. Those places were close, so Brian must have dropped them before the finish. Or was getting swallowed and barely made it. Either way, he had a great race. I wrote that post yesterday about not worrying about not training so early, then I see the results of a race that a team-mate is in and feel badly about not going. But, I know, I can’t just yet. I’m heading to Kansas City to go to KU Med today to see my rehab neurologist. I haven’t seen her in a few weeks, so that will be good. I am much better, or at least better, than the last time I saw her. It is an hour there, so it takes most of the day. On the way, I’m going by Garmin and see if the guys at their “Genius Bar” can help me with my Garmin. It is a mess and I’m getting a little tired of it. I plan to leave it there and come back by and pick it up after the doctor’s appointment, if possible. Plus I have an Apple appointment for my iPhone, so it is going to be a busy afternoon. I rode 100km yesterday, just not at the pace those guys did in Lyons. It was only around 50, which felt cold, but I’ve been cold for months. It was pretty windy, like over 30, so that was the main issue. We rode on gravel. A couple friends rode over from Lawrence and we rode them back. They were going good, like race good. It was nice seeing how I’m supposed to be riding, even if I can’t. I had 330 miles last week, so that isn’t too bad for February in Kansas. Plus, I feel a little better, but am still sick. Not crazy horrible, but sick, none-the-less. So this year I’ve ridden 1157 miles. I figure I’ve drafted about 20 of those miles, so the rest has been in the wind. And the wind is always here this time of the year. I’m a little beat and haven’t even gotten close to getting race fit. It might take a while this year. It would be nice riding in a group and getting in some easier miles. Okay, I need to get going. I have so stuff to do before driving. 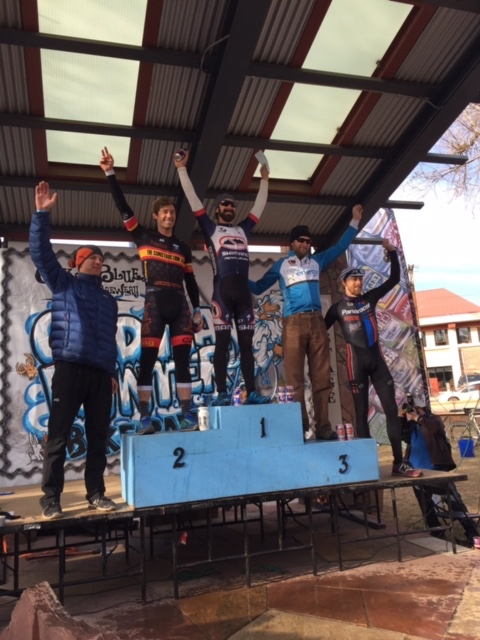 The podium from Colorado yesterday. Buddy of mine worked/volunteered at the gravel race in Texas you speak of. As they finish, he said it appeared Armstrong was just riding, not even racing and let Stephens win. Who knows. I thought the same thing looking at the finish line picture- LA looks like just some guy on a t-shirt ride pamphlet. I sort of wondered if he just let the other guy win because winning would bring certain negative attention. No doubt he cruised. There were some very very strong guys in that field and in the winning break and he never appeared to be in difficulty at any time. I highly doubt he is using any peds at this time so you can see just how talented the guys is. Peds or no peds the dude is a straight up badass on the bike and probably has an ftp of 380+ in his sleep.